Approximately 80 per cent of European and American citizens live in an urban environment. Due to their large populations and extensive commercial establishments, urban areas require large quantities of goods and services for commercial and domestic use. This results in increasing levels of demand for freight transport services. Freight transport in towns and cities is a major contributor to environmental impacts, particularly to local air pollution and noise. Urban Logistics addresses public policy makers, freight transport companies and receivers of supplies, providing them with the information and guidance to affect change in the logistics of the city. 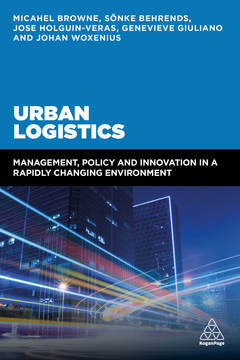 Urban Logistics is written by an outstanding team of international editors combining their expertise and using their research from leading business schools in Sweden and the US. There are also valuable contributions from academics and industry experts from companies and universities from all over the world. The book includes clear examples of initiatives that work and business case developments, as well as toolkits for policymakers and managers who are devising new initiatives. There is an in-depth examination of different aspects of urban logistics, such as retail logistics for cities, urban food supply chains, services and the special logistics requirements involved, construction, waste management and e-commerce and home delivery. There is also a focus on networks and partnerships and an analysis of innovation as a new constant. Michael Browne is former Professor of Logistics at the University of Westminster, and a current visiting professor at the University of Gothenburg, Sweden. Sönke Behrends is a researcher in the Department of Technology Management and Economics, Chalmers University, Sweden. Dr. José Holguín-Veras is Director of the Center for Infrastructure, Transportation, and the Environment, New York. Genevieve Giulano conducts research on relationships between land use and transportation, transportation policy analysis, and information technology applications in transportation at the University of California. Johan Woxenius is professor of Maritime Transport Management and Logistics at the University of Gothenburg.